The multifunctional adapters can be inserted into all kinds of plugs and provide an easy way of converting the world's power outlets into universal outlets. Use your equipment (e.g. power supplies, DC-AC, AVR and UPS) the world over thanks to the HQ Power adapters. 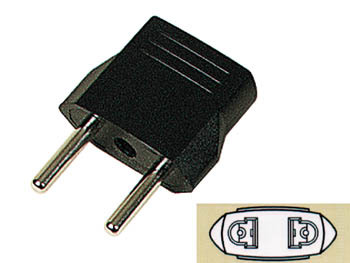 SCHUKO adapter plug with 2 round pins, Ø.16". Can be used with every type of plug, with the exception of UK plugs.